High quality speaker terminals. Gold plated brass, insulted design. 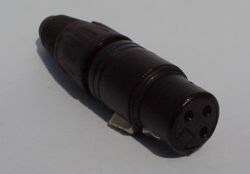 Terminates both plugs and cable with a diameter of up to approximately 5mm. Dual gold plated screws for the cable inside the cassis. The terminals can be mounted either as separate terminals or as a set with the delivered socket. Pictures and panel cut-outs here! RCA socket for chassis. 24k gold plated, Teflon isolated. Delivered with isolation washer. For mounting in 9.5 mm. hole. Really nice finish! Set with one black and one red connector. RCA socket for chassis. Delivered with isolation washer. For mounting in 9.5 mm. hole. 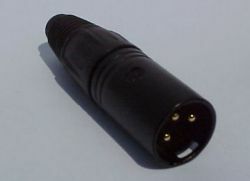 RCA cable connector with Teflon isolation. The material is gold plated brass. Solid centre pin. Accepts cables with diameters up to 5 mm. A quality connector at a good price! RCA cable connector with Teflon isolation. The contacts material is gold plated brass. Extra strong ground ring and split centre pin for optimal connections. Accepts cables with diameters up to 5 mm. Top finish and function! We sell only the best connectors from the Neutriks GOLD line! ´ ...and naturally matching cable connectors.